We now know the hardware details for the next gen gaming consoles. In short, they look a lot more like PCs than any console to date (at least so far as I’m aware*). Specifically, I’m talking about the PlayStation 4 and the Xbox One. AMD won the contract to supply the processor and graphics for both systems, and I expect that they’re nearly identical architecturally. The two biggest differences are that the PS4 has almost 3x the memory bandwidth of the Xbox One and the PS4 also has half again as many compute units in the GPU. Other than that, both machines use an AMD Jaguar chip with 8 cores. I’m pretty sure these 8 cores are in a 4-module arrangement, which means these consoles really only have 4 cores worth of floating point hardware, though that’s not clear from only 5 minutes of googling. I think the PS4 will have a distinct performance advantage, but I’m not sure how much that’s going to matter. Both systems are far more powerful than their predecessors, and neither system should have any problem driving a 1080 display at extreme detail. For the immediate future, the performance difference may not even be noticeable. Of course, the software environments will be more optimized than on a standard PC, so I expect the performance on both systems to stellar. I think the sales and marketing approach is going to matter a lot to the success of these systems. I believe Microsoft and Sony have rather different ideas about how people will use gaming consoles as we move forward. Microsoft is going for more of an “entertainment console” approach while Sony is pursuing a more “spare no expense” high-performance gaming rig. I don’t know what’s going to appeal to consumers. Microsoft has started off on the wrong foot by threatening to require a persistent Internet connection and trying to kill off the used game market. We may see a split between people who use their systems primarily for gaming vs. those who use their system primarily for entertainment. * Apparently the first Xbox was x86 based. This entry was posted in computers, gaming on May 23, 2013 by Frank Roberts. This post is a follow-up on my previous post, We have a MakerGear M2. We’ve spent a fair amount of time tuning the print settings and experimenting with different printing and design techniques. 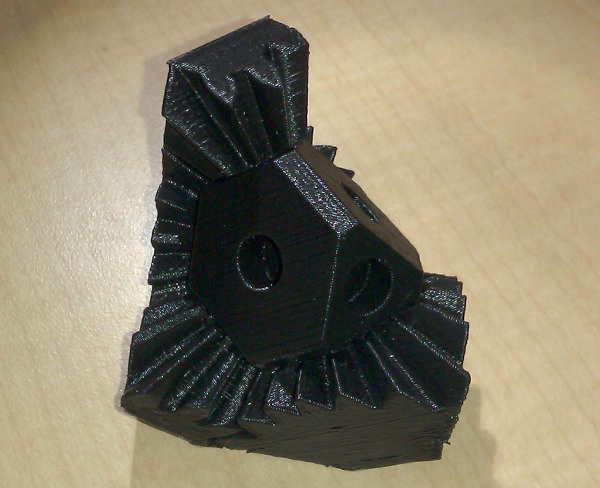 We started printing gear cubes pretty early on (http://www.thingiverse.com/thing:10483, not sure if that’s the exact model we’ve been using); we’ve printed about 3 at this point. As far as difficulty, they aren’t very intricate, but the overhang occasionally causes problems. These are probably the coolest things we’ve printed; they’re a lot of fun to pick up and fiddle with. This particular version prints the gears with the pins already attached. We’ve found that the versions that have separate pins tend to work better, if only because the pins are easier to replace when you break them trying to assemble the thing. Of course, we have run into a number of problems, most of them small. The above picture shows two things. First, these are the separate pins I mentioned. Second, the head occasionally catches the model it’s printing and we end up with a pile of goop (this happens very rarely). Now that I think about, third, we’re printing on painter’s tape. The models adhere to the tape better than the glass or to kapton tape. We usually only use the blue tape for smaller models though, as models with a large surface area end up bonding really, really well. Probably the most useful thing that we’ve printed is a doorstop. We like to keep the lab open, but the door has an automatic closer on it, so we need a doorstop. Getting a doorstop wasn’t really a problem, but the carpet in our lab is slick enough that the door pretty often would push the doorstop across the carpet until it was half closed. 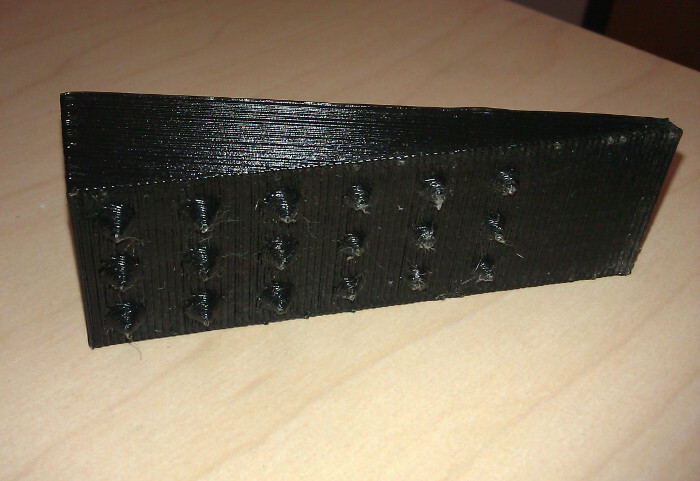 We designed and printed a doorstop with spikes and solved the problem (http://www.thingiverse.com/thing:64022). If you’ve been following Aggregate.org, then you’re likely familiar with MOG and our maze. 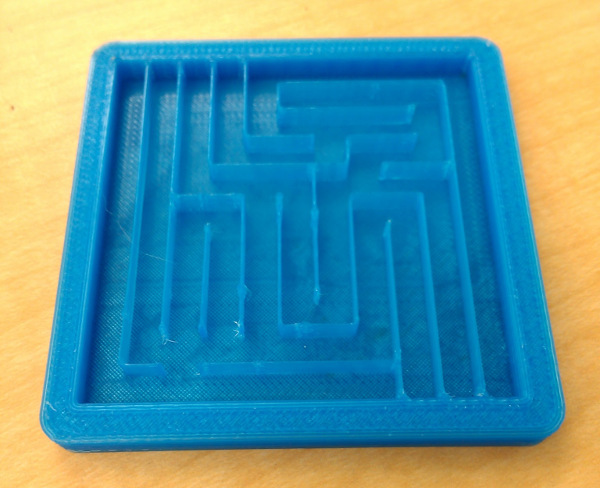 We’ve printed lots of these mazes at various scales. We printed some small ones, inserted ball bearings, and sealed some plastic over the top. They made pretty good handouts for the College of Engineering’s E-Day. The above is a picture of the bottom of one of the mazes. We’ve developed a cool debossing technique that allows us to print images and letters on the bottom faces of objects. A large part of the reason (excuse?) for buying this printer is that we can use it to print camera parts. 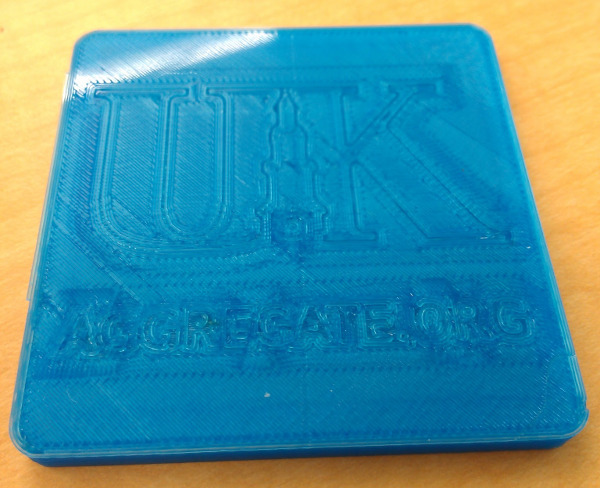 To do that, our advisor needs to be able to print very thin layers with great detail. 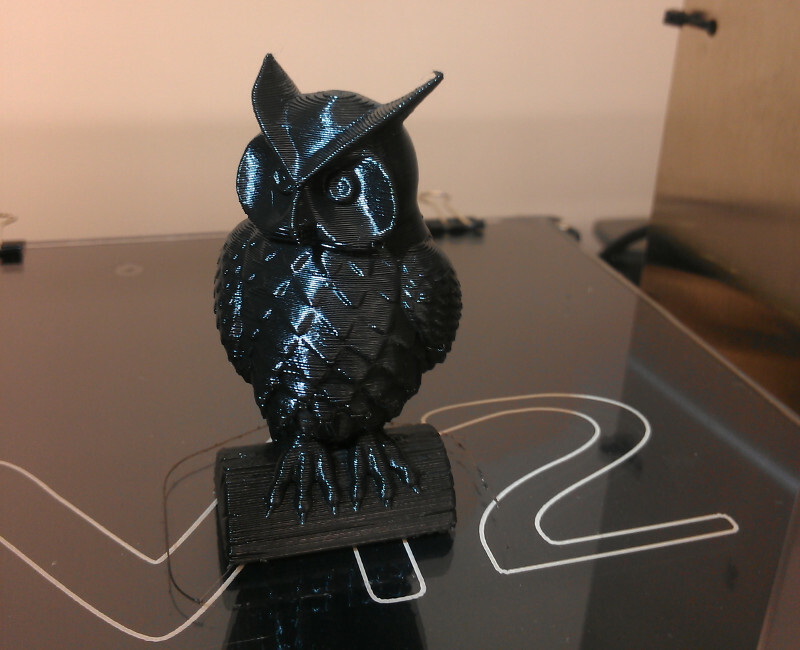 As a test, he started printing owls (again, not sure whether that’s the exact model). The owls are some of the most impressive items that we’ve printed. The owl in the picture below isn’t more than 2 inches tall; the detail is good enough that if you look from the right angle, you can see the nostrils clearly. In general, we’ve not had much trouble with the printer. We’re always tweaking the settings and we have to go through the optimization process every time we try a new filament, but our print quality has been steadily improving. We’ve had the print head jam once; cleaning that out apparently involved a small torch. This is probably my last update on the M2, as I’ve graduated and I’m not hanging around the lab anymore. If you want to hear more about it and see more pictures, you can take a look at this Google+ album. Also, our advisor is posting some of his designs on thingiverse. 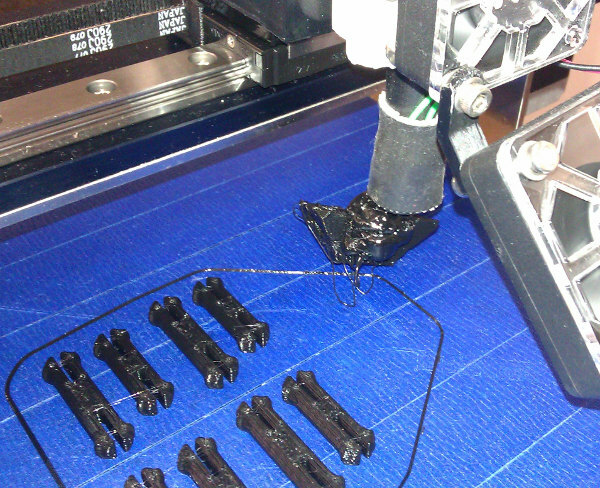 3D printers still aren’t ready for use by the general public. We’ve got ours working rather well, but keep in mind that it’s in a lab full of engineers who like to tinker. High quality printing takes a lot of time and tuning. That said, the process isn’t complex, and the default settings that MakerGear distributes are workable in most situations. I’m interested to see how 3D printing changes as it moves into the mainstream. This entry was posted in 3D Printing, aggregate.org, hacking on May 21, 2013 by Frank Roberts. The last month and a half has been pretty intense. I wrote the majority of my masters thesis while at the same time TAing CS115 and working on several other miscellaneous things. I successfully defended my thesis on April 19 and the graduate school officially accepted my thesis this afternoon. I’m finished with my degree and with school in general, at least for the time being. I should actually have time now to post here regularly. I’ve got an internship this summer with SDGblue. I’m not sure precisely what I’ll be doing, but SDGblue provides IT and other services with a strength/focus in security and compliance. I think this work will be interesting and I’m looking forward to it. In my spare time, I will continue work on NodeScape and the web front-end I’ve been working on as part of my masters thesis. This entry was posted in aggregate.org, life, metablog on May 2, 2013 by Frank Roberts. I decided at the end of last summer that it was finally time to replace my Dell Latitude D820. I looked at 14″ business laptops from both Dell and Lenovo. I started looking at the T430s, saw a good deal, and jumped on it. The T430s is thin, light, and sturdy. The build quality on this thing is great. I regularly carry it around open by the corner of the palm rest, and I don’t detect any flex. At just under an inch thick (0.83in – 1.02in), it’s easy to move it around and get it in and out of bags one-handed. The screen is a tad flimsy (it’s maybe a quarter of an inch thick), but this hasn’t really been a problem. The hinges, of course, are indestructible. Probably the most controversial thing about the Tx30 line is the new keyboard. Lenovo’s recently been switching all of their laptops to a chicklet/island style keyboard. This change rubs some veteran ThinkPad users the wrong way, as ThinkPads are known for their awesome keyboards. I never spent much time using a ThinkPad before this machine, so I can’t compare with the old keyboards. I can say that the keyboard on my ThinkPad is the best keyboard I own. The keys have a fair amount of travel, and their response is satisfyingly crisp. I believe it’s the best laptop keyboard available. Consumer laptops all have mushy keyboards (I recently assessed the state of keyboards at Best Buy), and the keyboards on Dell’s business laptops, while much better than the consumer laptops, still leave something to be desired. My only keyboard complaints are the Caps Lock, Page Down, and Page Up keys. The Caps Lock key doesn’t have an associated LED, and I regularly find myself brushing it and then wondering if I hit it hard enough to activate Caps Lock. Without an indicator, I’m forced to guess and check. The Page Up/Down keys are tiny and are nestled in above the left and right arrow keys. The arrow key matrix is the only place on the keyboard without much gap between the keys, and I sometimes have problems hitting Page Up when I really meant to hit left arrow. On a related note, I decided to get the backlight option on the keyboard, and I must say that that was a very good choice. This option pays for itself the first time you try to work in the dark. I hit Fn+Space and I can see my keyboard again. The backlight has two brightness settings. I can change the current setting by tapping Fn+Space. Tapping Fn+Space a third time turns off the backlight and turns on the ThinkLight, which is another great feature (albeit one that’s apparently disappearing on the next generation). One disadvantage of having a compact 14″ laptop is the loss of depth. The keyboard is roomy, but what I get in keyboard space I give up in touchpad arrangement. The arrangement gives priority to the TrackPoint nub/buttons, which I don’t often use. I prefer to use the touchpad and the Left/Right buttons below the touchpad. Unfortunately, the buttons aren’t very tall (1/3″?) and are situated right on the edge of the chassis. They’re easy to miss. The touchpad itself is rather large. The size is nice, because it basically gives me more resolution for small gestures. Unfortunately, the size of the touchpad and the lack of a physical delimiter on the pad means that I tend to palm the touchpad when typing. A few generations ago (Tx00?) Lenovo started using textured touchpads. It took some getting used to, but I actually like having the little bumps. This post pretty well covers my thoughts on the keyboard and other input devices. I’ll talk about other features and give more thoughts in a future post. This entry was posted in computers, mobile computing, reviews-hardware on May 1, 2013 by Frank Roberts.